Integra: I assume you’ve already made arrangements? Walter: Yes. You’re booked for a week on the cruise ship Demeter. Integra: Not the Demeter that Count Dracula traveled on, I hope? Walter: Of course not — I checked. It just happens to have the same name. There’s absolutely nothing to be worried about! Walter: …I’m sure the ominous clap of thunder was just a coincidence. Integra: Perhaps. But I’m not ruling out “sign from God” just yet. Integra: Can you think of any other times? Walter: Just one. You were eight years old. They never did rebuild that amusement park. But this time will be different. I promise — we’ve worked out a few precautions to make sure that no vampires will disturb you this time. First: sunlight is hateful at best, fatal at worst to vampires. The brighter, the more harmful. Second: running water poses a problem. And the ocean itself is like the pits of hell to them. Integra: I was afraid of that. Walter: This is one of those “that’s so crazy that it just might work” ideas, isn’t it? Seras: One week, or two? Walter: Better make it one. I don’t think I could hold Integra’s job longer than that. …and the plan is executed. Seras (thinking): Sir Integra could really use a vacation. Baobhan sith: This could take a while, couldn’t it? Baobhan sith: So now what? …you will help me to dessstroy Sssir Integral…and her little vampire, too, Agreed? Erin: Now, here’s a loaded question if I ever heard one. Email: Where do you get your ideas? First of all, whenever you get an idea, write it down. I have a notebook in which I jot down every amusing Hellsing-related idea I have for future reference. 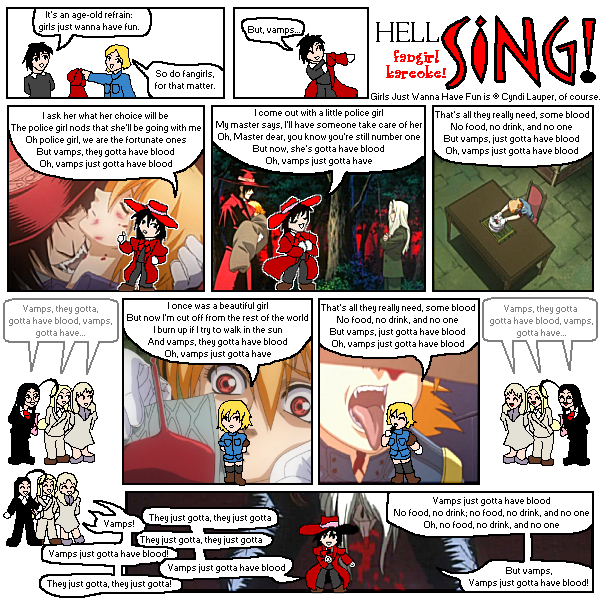 Look for ideas all around you; relate random things (Dr. Seuss, Windows 98, your history class) to Hellsing. 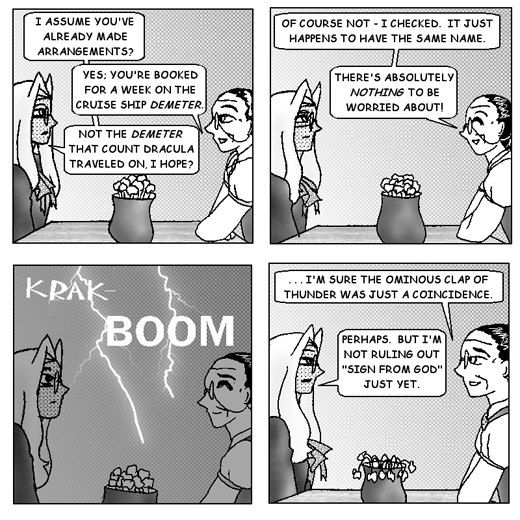 Consider what the characters would do in bizarre situations (the whole upcoming storyline started with two such words). Jot down funny things your friends say about it (I get a lot of jokes from my mom, unintentionally on her part). 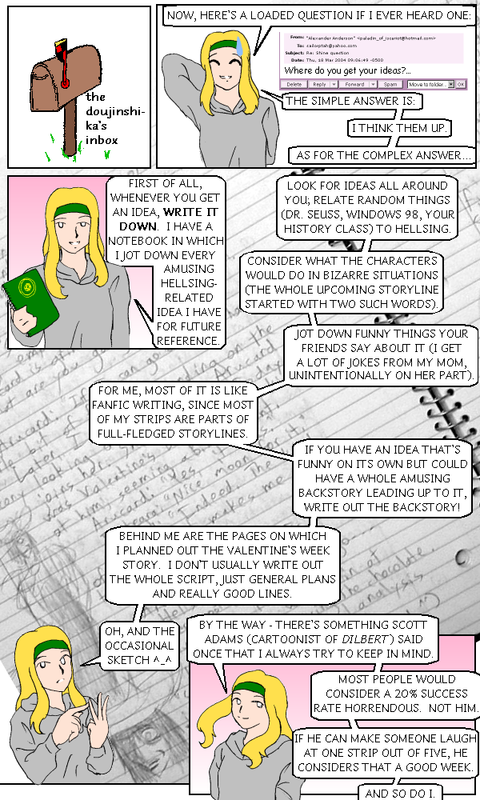 For me, most of it is like fanfic writing, since most of my strips are parts of full-fledged storylines. If you have an idea that’s funny on its own, but could have a whole amusing backstory leading up to it, write out the backstory! By the way — there’s something Scott Adams (cartoonist of Dilbert) said once that I always try to keep in mind. Most people would consider a 20% success rate horrendous. Not him. If he can make someone laugh at one strip out of five, he considers that a good week. And so do I.